Cataract of the eye is a disease that affects every other person over 65 years of age. It is considered to be the leading cause of blindness in the world and is very easy to diagnose it with ophthalmologic examination. This disease represents a clouding of the eye lens, which disrupts and weakens the function of vision. It starts with a gradual blurring, and leads to temporary blindness. 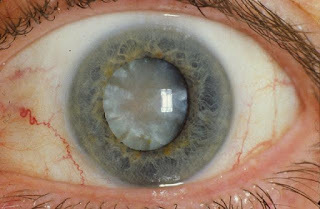 Cataract in one eye is quite rare, it usually occurs in both eyes, but it progresses differently. The only cure for cataracts is surgery - cataract surgery. Fortunately there are a number of natural products which can help to ease the discomfort. When it comes to cataracts, symptoms are easily visible and do not pose a greater problem for a diagnosis. A routine in the ophthalmic clinic is often quite sufficient. In the early stages of the disease the vision is blurred and the person has the impression that he or she is looking through a dirty glass all the time. During the progression of the disease, there are other means, such as flashes due to strong sunlight or light sources. Vision becomes unclear, there is double vision in one eye. There is a change of perception of colors (they are faded and unclear), as well as difficulty seeing in low light and at night. Frequent changes to the diopter glasses. Cataract of eye hampers the normal course of life, interferes with daily activities, fatigue and evokes a sense of insecurity. Often causes headaches. Reading, driving, especially at night, sports and many other activities are very exhausting to a person with gray cataract. Experience shows that every natural lens over time further blurs and thus loses its original transparency. This is certainly the result of aging or slowing down the changes due to the metabolic processes in the body. The cause of cataracts can be injury, previous eye surgery, ultraviolet radiation, as well as diabetes. Long-term use of certain drugs, such as corticosteroids, is also considered to be a significant risk factor. Although it is most common among the older population, it can also occur in children and even in babies. If decreased visual acuity significantly interferes with your daily activities cataract surgery is necessary. Recommendation for a surgery can only be given by an ophthalmologist after diagnosis. The ophthalmologist will examine the eyes in detail or have an ultrasound examination. If the visual acuity is reduced to 0.7 such people have a problem with a sense of color and weight range. It often comes to injury when climbing stairs, in these cases possibility of surgery is strongly considered. If the cataract eye is operated, just before the intervention it is necessary to prepare each patient. Be sure to do ECG, urine analysis and blood and all the other necessary checks required by your doctor. Surgical intervention is not painful and is short - only ten minutes. The patient is placed comfortably on the couch and does not feel any pain. Small incision is made, which in most cases is not necessary to be sewn, except in cases of diagnosed astigmatism. After surgery diseased rest the next half an hour, after which the patient can go home. When it comes to cataract postoperative recovery in the majority of patients it is easy and successful. Improvements are visible 24 hours after surgery. For the full recovery it takes seven days. Then the risk for any complication is significantly reduced. In fact, they are now extremely rare, occurring in less than 1 percent of cases. When it comes to cataract surgery price in private clinics is around 1,200 Euros per eye. However, the military medical academy prefers patients with military record, although the examinations and surgical procedures can extend to civilians. To avoid cataract surgery natural therapy should start on time. There are a handful of excellent alternative medicines which bring improvement. Wraps and herbal drops, if applied several times a day, can give excellent results. You just need to be persistent. If the cataract eye is already diagnosed before the application of any natural medication required is to consult with the ophthalmologist. Mix a good quality local honey and propolis, which you bought in a pharmacy which is intended for children in relation 1: 1. Pour the bottle of solution that can be used as drops. Pour two drops in the eye three times a day. Store in the refrigerator for three days, and then create a new mix. Cook Marigold tea with 3 tablespoons of flower and pour half a liter of boiling water. Leave it to stand for two hours. Strain and drink half a cup four times a day, drink in parallel with eye wash. If you have aloe in the pot (at least three years old), make a freshly squeezed juice and pour in the eye. You can create and mix equal parts of juice of aloe, honey and distilled water. The best measure is one teaspoon. If the symptoms of cataracts are present in your case, put a few drops several times a day. Cataract of the eye can be treated successfully using herbal wraps, which will certainly alleviate discomfort. Parsley lining was the applied for centuries in folk medicine for most eye diseases. Wash 6-8 leaves of fresh parsley leaves, put on your eyes and tie with a gauze. Leave it to stand throughout the night. In the morning, in a darkened room, remove the bandage and wash with water with the squeezed lemon juice. Repeat daily until the desired result. Caraway seeds, pour in a linen bag, boil, cool and put on your eyes before going to bed. Let them operate throughout the night. Make a mixture with equal parts of the leaf of burdock, plantain and butterbur. One tablespoon of this pour with 2 dl of boiling water and leave the lid on until it cools. Strain, soak swabs or pieces of gauze and tighten the eye. Keep it on for at least half an hour. Cut 30 g of dried field horsetail and mix with 10 g of fresh young nettle. 10 grams of this mixture pour in a cup of boiling water and cook for three minutes on low heat. Strain and cool. Take 100 ml before a meal between 14 and 21 days. If the cataract on the eye is troubling, try the following recipe with green tea. Drink three cups of beverage a day and feel free to put mild lining on the eyes. Keep them for about ten minutes, and try to do it three times during the day. Surgical intervention for some people is going to sound scary. This operation is fast and easy, but many would avoid. If it is necessary, apply some of the popular natural remedies, but with mandatory consultation with the ophthalmologist. Carve an apple so that one side remains closed and pour into it a quality local honey and close the extracted "cap"! Leave it to stand for two days. The resulting juice is poured in a bottle with a dropper and twice a day pour two drops in the eye. Chicken egg cook for half an hour, peel the egg. Cut it in half, remove the yolk and honey in the place of it, and leave it to stand for one day. The resulting liquid pour in a bottle with a dropper and refrigerate it. Twice a day pour it in the eye. Four cups of carrot juice mix with a glass of freshly squeezed juice of endive salad. Add to them one-third of a cup of freshly squeezed juice from the leaves of parsley. Juice put in the refrigerator and take half a glass before meals, three or four times during the day. A simple cure for cataracts can be made by squeezing the juice from the onion and mix it with distilled water. The ratio is 1: 1. Sprinkle a few drops in both eyes three or four times a day. After the application almost immediately tears will appear. Do not worry this is quite normal. Pluck the fresh leaves, wash well and then squeeze the juice from them and mix with the juice of onion. Use as drops three times a day. After 45 minutes, pour the drops of honey and propolis in combination with water. The results are expected as early as next week, and the treatment can be repeated in a month. Mix 1 tablespoon of the sticklewort leaf and flower of centaury with 2 tablespoons of eyebright flower. All of this pour with 4 dl of boiling water, cover and leave to stand for two hours. Strain and put the wraps three times a day, keeping them for half an hour. Also, in the eyes use one teaspoon of tea three times a day and hold for five minutes. Apply for ten days. Make a mixture with 1 tablespoon of plantain leaf, wormwood leaf and 2 tablespoons of cornflowers. Prepare and use as in the previous recipe. Mix 1 tablespoon of burdock leaf and leaf and flower of Coltsfoot and 2 tablespoons of sticklewort. Prepare and practice in the same as in the previous two cases. We hope that you found out what is the cataract of an eye. We recommend you another useful article: how to improve vision at a distance.